New communities should be conceived as towns and must possess all the vigor and vitality that pedestrian traffic brings to city life. The new town of Playa Vista accomplishes this by creating lively districts and neighborhoods composed of courtyard housing and townhouses, rather than merely housing projects, segregated office parks and isolated shopping malls. Playa Vista’s building fabric is subdivided into six neighborhoods and three districts: the marina, the office campus, and the town center. 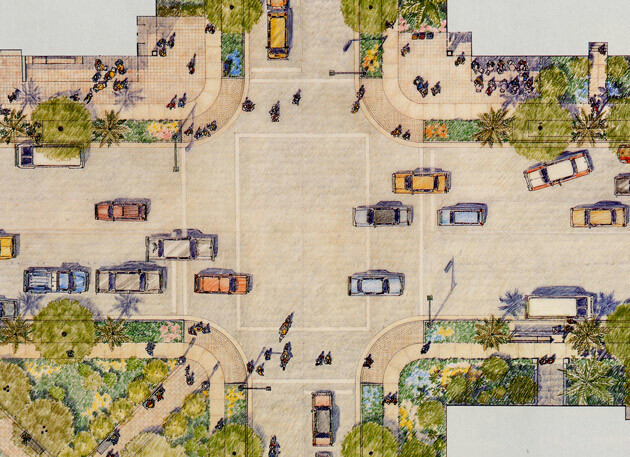 Small parks with schools, civic and cultural facilities, and corner retail within easy walking distance provide the focus for each neighborhood. Buildings are mixed-use and have courtyards and gardens either visible from the street or indicated by overhanging trees and climbing vines. The plan has been hailed as environmentally exemplary: Over 300 acres of wetlands will be restored in order to preserve native flora and fauna; a recreational riparian corridor serves as a conduit for recycled gray water; magnetic cables buried in the streets power electric transit; and car use is minimized by supporting walking, bicycling and public transit. In collaboration with Duany Plater-Zyberk, Moore Ruble Yudell, Hanna/Olin, Legorreta Arquitectos.